A Great Big World is addressing the struggles of living with multiple sclerosis through a powerful ballad. 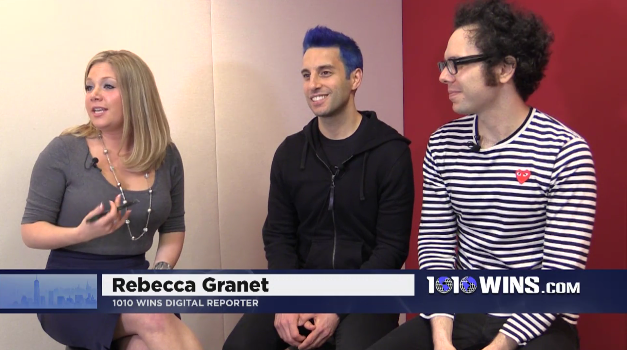 1010 WINS’ Rebecca Granet sat down with band members Chad King and Ian Axel to talk their New York City roots, growing confident, and King’s experiences living with MS.
May 25 is World MS Day, which celebrates the ways that people are affected by the disease while still maintaining independence and living full lives. The band’s song “Won’t Stop Running” sheds light on the personal experiences of living with MS. King was diagnosed with the disease in 2007. Multiple sclerosis is an unpredictable and often disabling disease of the central nervous system that disrupts the flow of information within the brain, and between the brain and body, according to the National Multiple Sclerosis Society. “I started getting vertigo as my legs would buckle. The first doctor I saw said I had MS. I didn’t believe her, I didn’t know what it was,” King told 1010 WINS. King said the symptoms were progressing and finally after a third doctor diagnosed him with MS, he accepted it was a reality. They told him he’d most likely be paralyzed in seven years without medication. He tried medication, but said it caused him severe side effects including seizures. “I didn’t feel like him saying I was going to be paralyzed was in my cards. I needed to do everything in my power to not make that come true. [The medication] wasn’t working for me,” he said. He began a holistic, alternative approach to treating the disease including exercise, diet, and stress relief. He said he’s been symptom-free for years. “This song in particular was my response to that doctor who said I would be paralyzed,” King said. Axel adds that an important part of the group’s dynamic was communicating with each other and changing his lifestyle to support his bandmate.